Secretary of Defense Jim Mattis speaks during the Air Force Association's Air, Space and Cyber Conference 2017 at National Harbor, Maryland, on Sept. 20 (Alan Lessig/Staff). 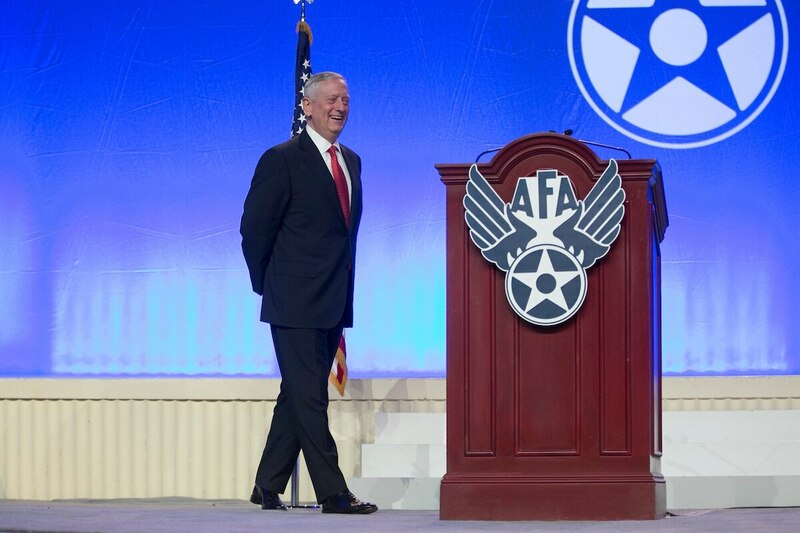 Secretary of Defense Jim Mattis is known to speak candidly during, and his speech Wednesday at the Air Force Association Air, Space and Cyber conference was no exception. “It was a slow news day I think and somebody made it up,” Mattis said, noting that even his troops laughed when they read the news. “My call sign was ‘Chaos,’” Mattis continued to laughter and applause from the audience. “But I must confess how I got that name. Hint: it's not from Sun Tzu. When the call sign originated, the then-colonel was a regimental commander in Twentynine Palms where, according to Mattis, “there’s nothing to do but go blow up the desert.” As he was leaving his operations office, he noticed the word “Chaos” written on the operations officer’s whiteboard. “I said, ‘What’s this about?’ I’m curious, you know. We all are. He says ‘oh you don’t need to know that,’” which only further piqued curiosity. “Finally, he kinda said, ‘Well it means the colonel has an outstanding solution,’ and it was very much tongue in cheek, ladies and gentlemen. They didn’t consider all my solutions quite as outstanding as I enthusiastically promoted them,” said Mattis. Mattis ended up adopting the moniker as his call sign.